China's first heavy-lift Long March 5 rocket launches into space from the country's Wenchang launch center on Hainan Island at 8:43 p.m. Beijing Time on Nov. 3, 2016. China's powerful new heavy-lift rocket soared on its maiden flight today (Nov. 3), bringing the nation one step closer to building its own space station in Earth orbit. The Long March 5 rocket lifted off from the Wenchang launch center on Hainan Island, off China's southern coast, at 8:43 a.m. EDT (1000 GMT; 8:43 p.m. Beijing time), according to Chinese media reports. But the main goal of today's flight was to test the rocket, which consists of two stages and stands 187 feet (57 meters) tall. The Long March 5 is capable of lofting 27.6 tons (25 metric tons) to low-Earth orbit (LEO) and 15.4 tons (14 metric tons) to the more distant geostationary transfer orbit, according to the China Aerospace Science and Technology Corp. The Long March 5 is a crucial piece of China's ambitious space plans. For instance, the rocket will launch the big modules that make up China's 60-ton space station, which the nation hopes to have up and running by 2022. China's first Long March 5 heavy-lift rocket rolls out to its launchpad at the Wenchang launch center on Hainan Island ahead of its successful Nov. 3, 2016 launch debut. The Long March 5 will also loft Chang'e-5, a robotic sample-return mission to the moon. Chang'e-5 is currently scheduled to lift off sometime next year, Chinese space officials have said. The new rocket is part of the venerable Long March family, which has been launching spacecraft for more than four decades. Two other members of this family made their debuts recently as well: The Long March 6 and Long March 7 vehicles flew for the first time in September 2015 and June 2016, respectively. 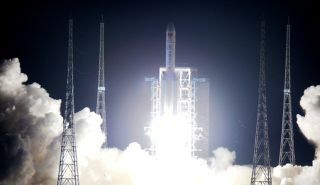 Long March rockets have historically used toxic fuel such asdinitrogen tetroxide, but the three new vehicles are powered by a more environmentally friendly kerosene/liquid oxygen combo.